If you have been reading Southern Plate for any length of time, or have a copy of my third cookbook, Sweetness, this recipe may be familiar to you. That is because I originally posted it five years ago and told the amazing story of Miss Molcie. But some recipes are worth the extra special treatment and this is definitely one of them so I’m posting it again with photos befitting the splendor of this amazing bread. You can see that original post by clicking here. Molcie Dobbs is a phenomenal woman. As a twenty-two year old my grandmother had moved out of her family home and took a man’s job driving a forklift at TCI, the Tennessee Coal, Iron and Railroad Company. She put in an application every afternoon until she got the job, of which she knew nothing about. There she met my grandfather, fell in love, and started the wonderful family I belong to. 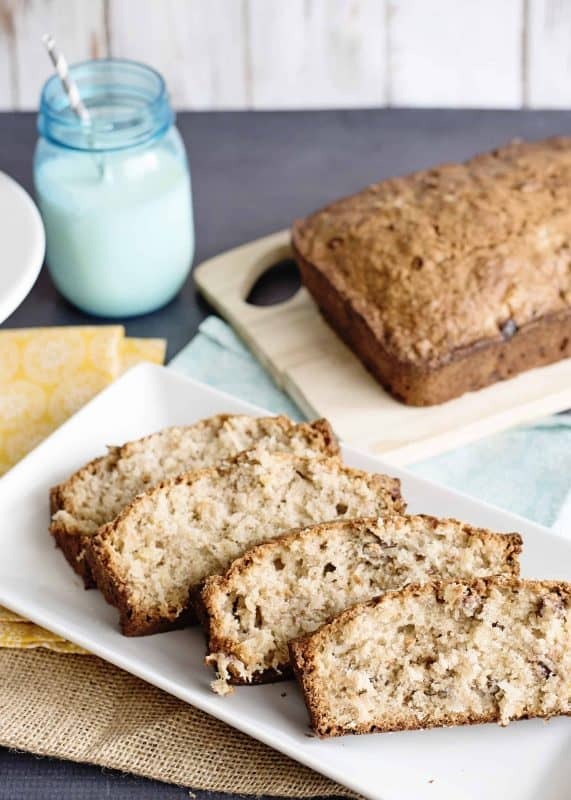 Her Hawaiian Banana Nut Bread is just like her—an average old-fashioned favorite, a kind that looks just like every other one on the outside. However, once you slice it open and experience it, you notice that there is something distinctly different and special about it, and her. Thinking about Miss Molcie today has me thinking about her indomitable spirit. Nothing held her down, it seemed. When unfavorable circumstances came her way, she pushed up her sleeves and got to work making the situation work out the way she felt it should. When I look around the world today, I see the need for as many of us as possible to follow her lead. It’s hard not to become cynical in today’s world, but if we want that world to improve, we can’t afford to give in to cynicism. We have to go counter to where the circumstances are attempting to lead us. Kind of the wise adult’s version of the “opposite game”. We need to double down on showing compassion, kindness, understanding, and respect towards others, not just those who line up with our own belief system. We have to stop thinking in terms of “us” versus “them” and realize that we are all here together, focusing more on what we have in common than what divides us. We have to be good neighbors again. We have to be good people again. We have to smile more and post kindness instead of angry tirades. We have to stop being offended and start building bridges. Someone has to build the bridges – because bridges are needed to connect people across vast divides. And in the middle, maybe we could hand over a loaf of this delicious bread and tell them the story of Miss Molcie. I bet they have a similar story in their life to share. And just like that, a connection is formed and humanity rises to the surface. And that is the world that I want to live in so that is the world that I am going to put my efforts into building up today. 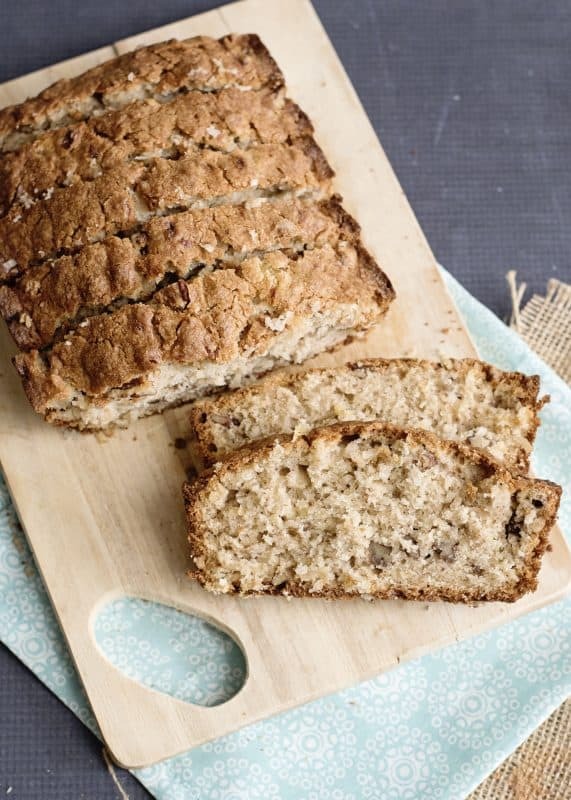 To make this amazing bread, you’ll need: flour, sugar, baking soda and salt, cinnamon, chopped pecans, shredded coconut, eggs, bananas, oil, crushed pineapple, vanilla and a little bit of coconut flavoring or extract. 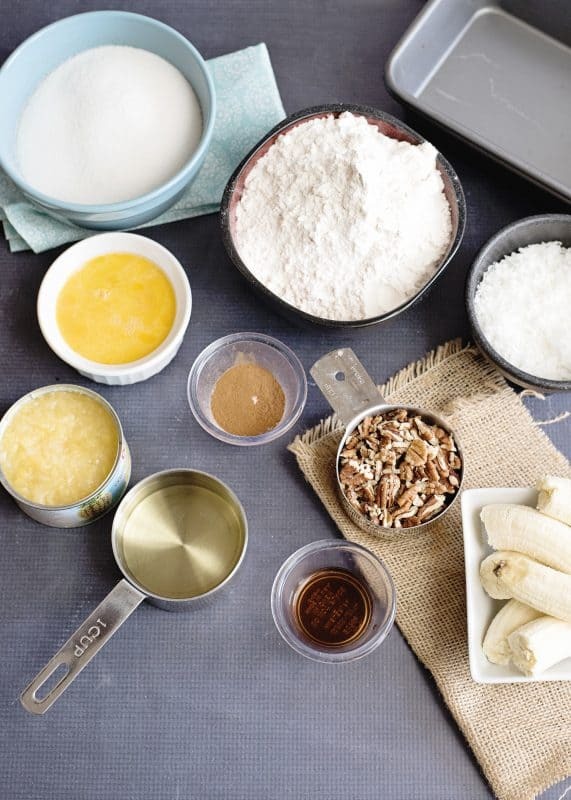 In a large bowl, whisk together dry ingredients. In a separate bowl, do the same for the wet ingredients. Pour the wet ingredients into the dry and stir with a spatula or large spoon until just moistened and combined, careful not to overmix. Divide mixture evenly among two well greased pans. If your pans aren’t nonstick you may want to grease and flour them. Bake at 350 for one hour and fifteen minutes, until lightly browned and a toothpick inserted in center comes out clean. Remove from oven and allow to cool for ten minutes before turning out of the pan to cool completely. 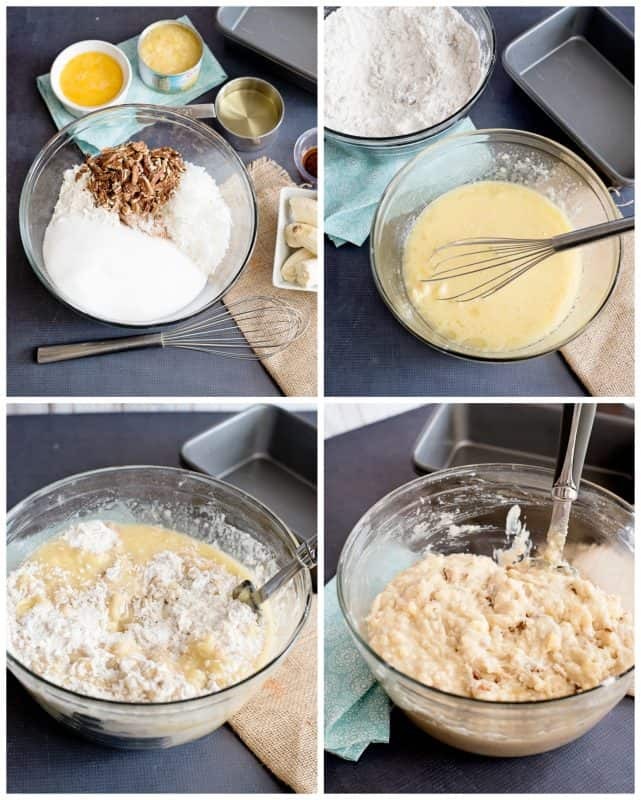 In large bowl, whisk together dry ingredients. In separate bowl, whisk together wet ingredients. Add wet mixture to dry mixture and stir with a spatula just until moistened. 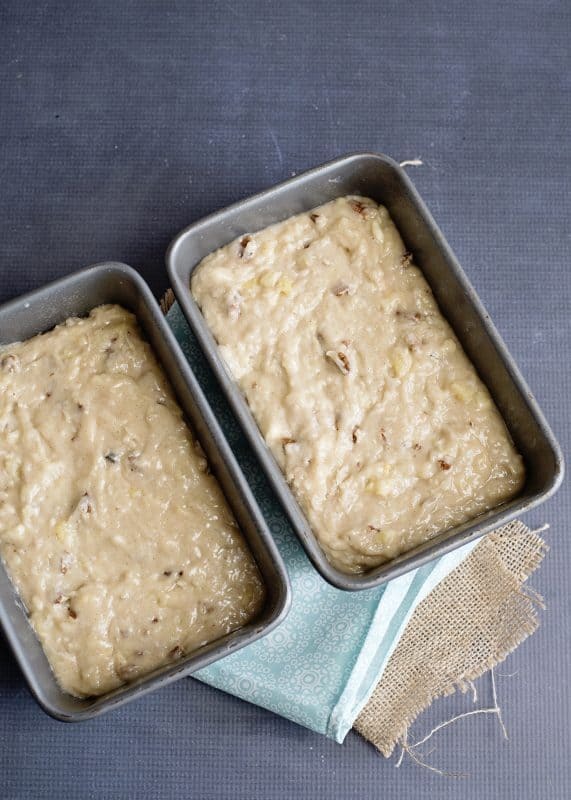 Pour into 2 greased and floured 5x9 inch loaf pans. Bake at 350 for 1 hour and 15 minutes. Cool in pans on wire rack for 10 minutes. Remove from pan to the wire rack and cool completely. Makes 2 loaves. Tried this recipe?Mention @southernplate or tag #southernplate! Seek Justice, Love Mercy, Walk Humbly. How I Got My Entire Family To LOVE Drinking Water! can i make this without the coconut ? would it come out the same ? or do i need to substitute something for the coconut ? I wondered about the coconut as well. Would it work to leave it out? Hi Cathy, you can just leave it out. If you wanted to play around and try a substitution that is fine but it won’t hurt it to just leave it out. My husband Dosent like pineapple is there something I could substitute for it? Hi will this batter work as 24 muffins? Most definitely! I am her daughter-in-law and I make mini muffins all the time (5 dozen). Her recipe delights so many that I am always happy to carry on her legacy with such an amazing recipe. I love to make these and give the away like she did. Share her love through baking! Thanks so much, blessings to tou and your house. Blessings to you and yours as well Mary!!! Post the recipe for the butter rolls……….Appreciate it……….. I know!.. make, .just freeze or cut in slices and wrap individually…then..have for a snack or for breakfast when no one else needs to eat it…I love coconut,pineapple and nuts…love…I would even probablly add a little less flour and add some flax to make it more healthy…enjoy! I LOVE coconut! I LOVE pineapple! I LOVE Hawaii! I am making this bread in just a moment. I can hardly wait to taste it! Yum and I can give away a loaf! Thank you Christy for sharing another good recipe. (At least I expect it to be yummy good!) I might make another comment after I make it just to let you know what I thought about the finished product. I hope you enjoyed it Melinda!!! Do you use sweet or unsweetened coconut? Would vanilla extract work instead? I like coconut, but afraid it may to much of a coconut flavor. Is the coconut flavor mild? Coconut flavor is very mild.